Place the single cream in a pan and bring to the boil. Cut the smoked herring into small pieces and add to the cream. Heat for a further 20 seconds (until it comes back to the boil). Place the cream in the refrigerator overnight, then filter. Whisk the cream until it is light but firm. Season with salt, pepper, a few drop of tabasco and lemon juice. Boil the Prunelle potatoes with their skins on, then wrap them in cling film while they cool. 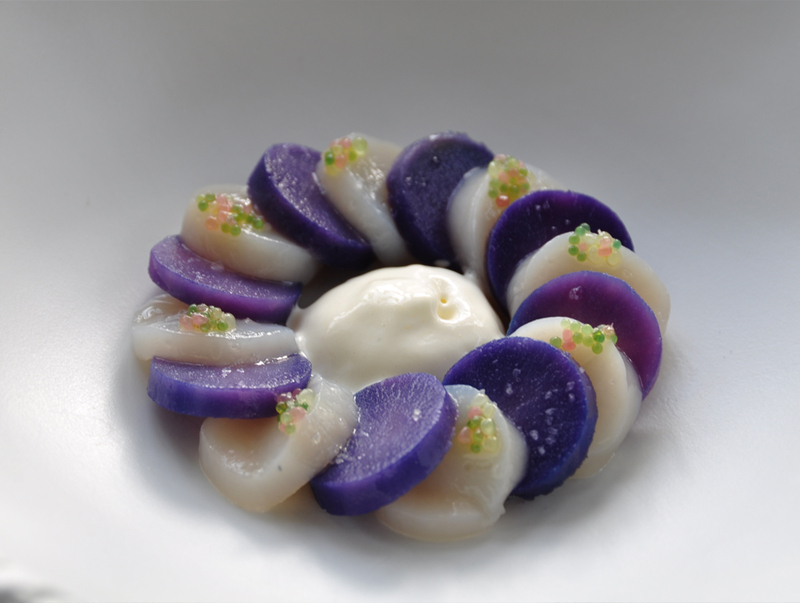 Cut the scallops and cold Prunelle potatoes into thin slices, then place them in cookie cutters to obtain standard sized contents. Make a vinaigrette using the olive oil, salt, pepper and finger lime. Create a rose-shaped shape (rosace) in a deep dish using alternate slices of Prunelle potatoes and scallops. Drizzle with vinaigrette and add the smoked herring cream to the middle of the rosace.